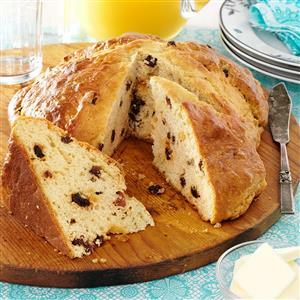 This traditional Irish soda bread can be made with an assortment of mix-ins such as dried fruit and nuts, but I like it with a handful of raisins. Preheat oven to 375°. In a large bowl, combine flour, brown sugar, baking powder, baking soda and salt. Cut in butter until mixture resembles coarse crumbs. In a small bowl, whisk 1 egg and buttermilk. Stir into flour mixture just until moistened. Fold in currents or raisins. Turn onto a lightly floured surface; knead gently 6-8 times. Shape into a round loaf. Transfer to a greased baking sheet. Using a sharp knife, cut a shallow "X" on the top of loaf. Beat remaining egg; brush over loaf. Bake 30-35 minutes or until golden brown. Remove from pan to a wire rack; serve warm. Yield: 6-8 servings.